Users can now make payments and pick up offers or rewards at American Eagle Outfitters, The Container Store, Foot Locker, Guess, Jamba Juice, Macy’s, OfficeMax and Toys R Us. American Eagle Outfitters, The Container Store, Foot Locker, Guess, Jamba Juice, Macy’s, OfficeMax and Toys R Us have all now begun accepting payments via Google Wallet at selected stores. All the merchants are also offering either special offer coupons or loyalty programs via SingleTap terminals and, in some instances, are offering both. 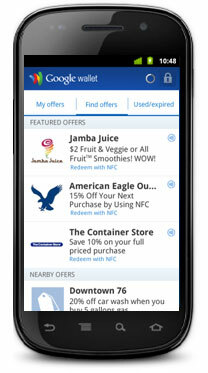 With the entry of the eight retailers into the service, the Offers tab in Google Wallet has been updated to include a new Featured Offers section with discounts that are exclusive to Google Wallet users and a Loyalty Cards section has been added to enable users to use their mobile phone to collect reward points as they shop. Current offers include 15% off at American Eagle Outfitters, 10% off at The Container Store, 15% off at Macy’s and an all-fruit smoothie for US$2 at Jamba Juice, while loyalty cards are available from Foot Locker, Guess, OfficeMax and American Eagle Outfitters. Chevron, D’Agostino, Faber News Now, Gristedes supermarkets and Pinkberry are also now working to add support for Google Wallet in their stores. “We’re hearing from people at check-out counters throughout the country that paying with your phone is a little like magic,” says Spencer Spinnell, Google’s director for emerging markets, writing on the official Google blog. “With Google Wallet in hand, you can walk into a Jamba Juice, American Eagle Outfitters or any other partner store,” Spinnell adds. “Once you’ve ordered that Razzmatazz smoothie or found the right color Slim Jean, head straight to the cashier and tap your phone to pay and save—that’s it. You don’t have to shuffle around to find the right coupon to scan or rewards card to stamp because it all happens in the blink of an eye. This is going to take off fast and may outdo Groupons and mimic the success of contextual link advertising of AdSense. Others might as well throw in the towel and call Google, Inc. the leader the of the pack. This is the NFC service that none of the other players including Isis and other banks and telcos cannot compete with – providing contextual and geo-location specific algorithms to provide both impulse and long term offers.